A very versatile traditional detached property, that would make a wonderful 6 bedroom family home or 3 self catering properties that would comprise of a 2 and a 3 bedroom house as well as a 1 bedroom apartment. 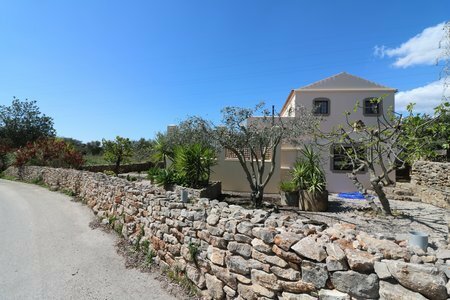 The property benefits from many original features and is in a very quiet and peaceful location just outside the town of Sao Bras de Alportel. The main house is entered via a spacious hallway and has a fully fitted kitchen with granite work surfaces and hand- built craftsman units, feature staircase which at present is utilised as a study/office area. The living/dining room to the rear of the hallway is south facing with a log burner and gives access to the terrace and garden. The staircase leads to 2 double bedrooms (1 with a terrace) and a large family bathroom with bath and shower. A wonderful covered terrace leads to the adjoining 3 bedroom property comprising of a fitted kitchen/diner, living room on the ground floor with door accessing the terrace and a staircase that leads to a second sitting area with direct access to a terrace, a master bedroom with en-suite, 2 further bedrooms (1 with a terrace) and a family bathroom. The 1 bedroom apartment is located at the end of the covered terrace and can form part of the 3 bedroom property as it has an interconnecting door if required or it can be used as an independent property. This apartment features one bedroom and a kitchen/diner/living room and bathroom. Outside, the property is partially walled and fenced to some boundaries and others left natural to be in keeping with the nature. The south facing front of the property has a wonderful terrace which is the full length of the property and has a dining area and views over the garden. The pool area is a major feature of this property and lies to one side, with either steps or a ramp providing access. A full-length covered terrace runs along the back of the house giving views over the land with access to the utility room/storage and great entertaining area. The property also benefits from a workshop, a laundry room and outside storage.